Here are some of the latest News items surrounding the Nottingham Youth Orchestra! Another fantastic residential for the Intermediate Orchestra! 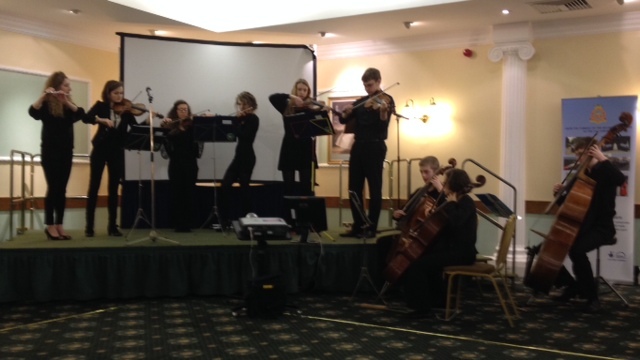 A huge well done to the Training Orchestra for a fabulous residential week-end. A credit to NYO! NYTO residential weekend - 25/26 April 2015. The weather was mostly kind to us and we had a whale of a time. Once rooms had been found and luggage safely put away, we set about the music. This weekend was very early in the rehearsal schedule, having only had one Thursday evening beforehand, so virtually everything was sight-reading, but as usual the children rose to the occasion magnificently, more than realising any conceptions I had gone to Lea Green with. After lunch came the most challenging part of the weekend. Beds had to be made. Unlike other years, they had to put sheets on mattresses, pillows in pillow cases and duvets in quilt cases!! Some managed quite well, others struggled and others needed a bit of "mum" help from some of the tutors, but once that was done they went off with the Lea Green staff for an afternoon on the assault course, where learned they needed to rely on the help of others and some overcame some minor fears with balancing and climbing activities. Another meal and a short rehearsal was followed by a night walk led by another of the Lea Green staff. Dressed in reflective jackets, equipped with some torches and maps, everyone went on a hike across fields, up and down hills and over stiles, returning to the centre at about 9.30, at which time they were so exhausted that many were actually ASKING to go to bed! So by 10.30 everywhere was quiet and most were fast asleep. Sunday dawned bright and sunny, although quite fresh, and we continued with our musical rehearsals although, there was a far bit of time to let off steam in the beautiful sunshine around the glorious grounds of the centre. Later in the afternoon, parents arrived for a short open rehearsal/informal concert where they were able to hear what their children had achieved in a relatively short time. I would like to think, by all the smiles I saw, that everyone enjoyed themselves and that they gained something not only musically but also were able to make new friends and socialise with their colleagues. Thanks to everyone who made it so enjoyable: Paula, whose tireless help and work on our behalf is so appreciated, the Lea Green staff, the wonderfully organised and unfailingly helpful parent/helper team and my dear instrumental tutors, who make it all happen. 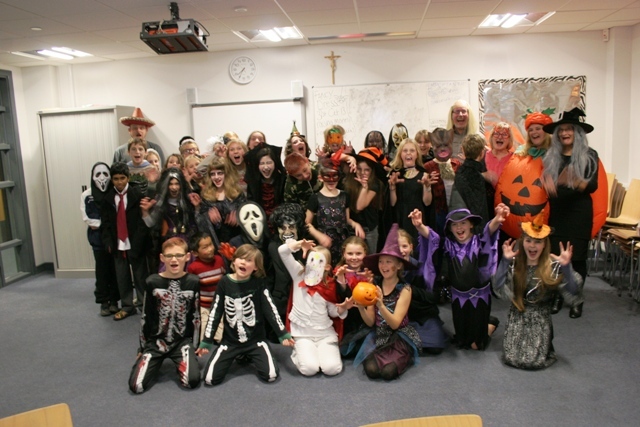 And of course thanks to the children who are such a pleasure work with and make it all so worthwhile. A great day with fantastic music. A huge thank you to everyone that turned up on Sunday and to the parents that stayed to help.... not forgetting those came to watch the final performance and help clear away afterwards. We really appreciate it. Chris, Trevor and the rest of the NYO team were very pleased with everyone's performance. Well done! Chris George was Leader of the Scottish Chamber Orchestra with whom he appeared as director and soloist throughout Europe at major festivals. He has also led and co-led the Academy of St Martin in the Fields, the Orchestra of the Royal Opera House, the Royal Philharmonic Orchestra and many others. Orchestras and chamber music groups have taken Chris all over the world with such artists as Murray Perahia, Joshua Bell, Christian Zacharias, Sir Charles Mackerras and Bernhard Haitink. Having suffered from the neurological condition Focal Dystonia which hampered his violin playing, Chris now has more time to devote to conducting and teaching. He did a Masters in conducting at the Royal Conservatoire of Scotland and recently conducted the BBC Philharmonic Orchestra and toured the UK with the Royal Northern Sinfonia. Chris loves his teaching, coaching and conducting at the Royal Conservatoire of Scotland, St Andrews University and with the National Youth Orchestras of Scotland where he also sits on the board. 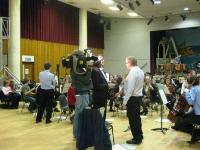 He is delighted to be working with the Nottingham Youth Orchestra. 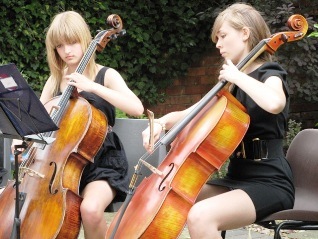 Both girls were successful in their audition to join the National Children's orchestra U11's. The orchestra is grateful to The Freemasons of Nottinghamshire who have once again agreed to help fund bursaries for players who would otherwise find it difficult or impossible to enjoy playing in the orchestra. 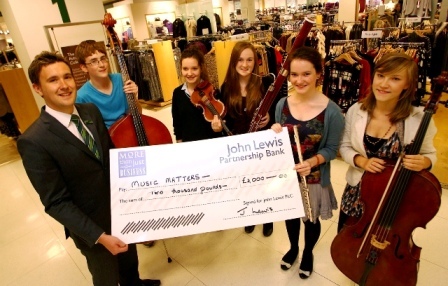 The cheque was presented to NYO at this event. Well done to Joy, Megan, Emma, Alicia, Thomas, Mathilda, Sam, Christabel and Matt who played fabulously well at the ceremony and were a real credit to NYO. NYO clarinettist Matt Glendening is the soloist playing Spohr Clarinet Concerto No. 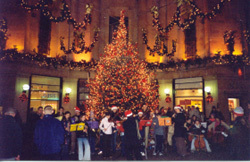 4 with Orchestra of the Restoration. A very worthwhile concert is taking place on Sunday 9th June at the Albert Hall in Nottingham. The concert will aim to raise money for charities involving music and young people. Some of the proceeds will be donated to NYO! An exciting programme of Elgar, Walton, Handel and Parry, and Beethoven's Choral Fantasia with amazing young pianist Isata Kanneh-Mason. On the morning of Saturday 2nd March 2013 over 60 young cellists from throughout Nottinghamshire had a very special opportunity to attend a free NYO workshop in the Royal Concert Hall. Having worked with tutors on pieces written only for cellos the players gave an informal performance to parents, family and friends on the stage of the Concert Hall. The performers were invited to stay on after the workshop to listen to Julian Lloyd Webber rehearsing with the Youth Orchestra in preperation for the evening performance of Elgar's cello concerto. 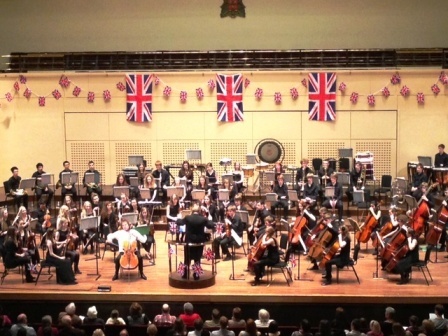 Nottingham Youth Orchestra were delighted to host this return performance to the Royal Concert Hall, which featured as part of their Best of British Prom Concert a truly memorable experience for the young musicians. The evening concert went down a storm with over 280 school children in attendance as well as a hugely supportive audience from all aspects of the local community. It is an enormous tribute to the talents and commitment of the Nottingham Youth Orchestra's young musicians that Julian Lloyd Webber, one of the world's great cellists, chose to play Elgar's Cello Concerto with them on Saturday night. As conductor Derek Williams commented during the interval: what an artist chooses to do in performance may be very different from what is rehearsed, so the orchestra had to respond to body language and listen to every nuance. Perhaps this explained the compelling intensity of their playing. The combination of the concerto's tragic nobility, the youthful energy of the orchestra and the long experience of a master soloist were irresistible - from the tense first movement through the skittering scherzo, the soul-searching adagio and the stoical determination of the finale. Other pieces on the "Best of British" programme included Holst's vivid music from his ballet The Perfect Fool and patriotic works such as Walton's Crown Imperial and Vaughan Williams' Greensleeves. Joining orchestra and audience in Rule Britannia, Jerusalem and Land Of Hope And Glory was young mezzo Katie Stevenson - whose voice has such expressive richness that it can't be long before her name is on every music-lover's lips. 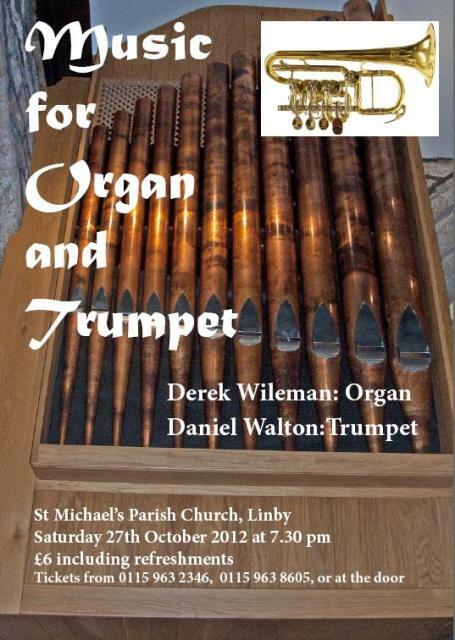 You might want to pop along to see a Concert of Music for Organ and Trumpet at Linby parish church on Saturday the 27th October 2012 beginning at 7.30 pm featuring ex-NYO member Daniel Walton who is in his second year at the Royal Academy. The cost is £6 per ticket, including refreshments. The church is well heated and has padded chairs! The organ pipes are at the west end of the church, so the chairs will be turned to face them and the organ console. Most of the pieces are short and tuneful. 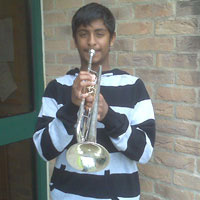 Daniel will be using a piccolo trumpet and a natural trumpet for some of his pieces. I would like to thank everyone involved: player, tutors and organisers, for making the 2011 Fundraising Event a resounding success. A big "Thank you" to Kristan Hopkins-Burke for volunteering to collate all the information and oversee the whole operation during a very busy time. Nottingham Youth Orchestra is holding a concert as part of the LOCOG Cultural Olympiad on March 3rd 2012 at the Royal Concert Hall in Nottingham which will be a Countdown Event for the London 2012 Festival, the finale of the Cultural Olympiad. As part of this event we asked local young composers to compose a celebratory opening piece for the whole orchestra which should appeal to a non specialist audience including school children. The winning composer will have their composition premiered in the concert on the 3rd March and also will receive a prize of £150. The second and third prize composers will receive Windblowers vouchers. 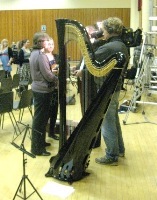 Join us to see Coleman's piece perfomed live on stage at our concert on the 3rd March 2012. Thank you to all the competition entrants, the judging panel were impressed at the high standard of all the competition entries. 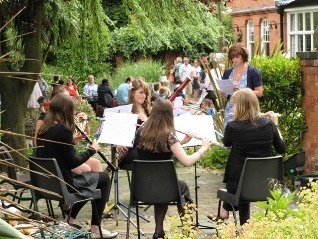 The Garden Party was a great success with many people coming to enjoy the beautiful garden and sunshine which was enhanced by the wonderful music that our ensembles provided. The afternoon raised over £2000 for the Orchestra. The money will be put into the bursary fund, which we give to students who otherwise may be unable to participate in tours and even in the orchestra itself. Thank you to everyone who came or bought raffle tickets for supporting the event. Our thanks go to the raffle prize donors, in particular Mr and Mrs S Whittle, who not only donated a raffle prize but more importantly the use of their garden and all its facilities. Thank you to all our helpers, parents and friends, as well as the excellent NYO/NYiO players and those who did any job that was needed. "The day began with Rodger Cull taking a full string rehearsal focusing on a Mozart Divertimento and Elgar's Serenade for Strings. We rehearsed throughout the morning with Rodger giving handy hints and taking us through how to make the best sound possible on our instruments. His suggestions included bow movement on the string, how high to place the bow with different degrees on the string for different occasions - eg. closer to the bridge for loud playing." "After lunch we separated into sectionals so we could really familiarise ourselves with the pieces and perfect the harder passages! We then performed a mini-concert for family and friends, bringing together all we learnt and signalising the end of a very productive day." The Politics Show explored peripatetic music funding in the county and the fact that parents fund a great deal of their children's music provision. NYO woodwind players were offered the opportunity to attend a woodwind workshop run by the renowned flautist Laura Jellicoe and oboist Hugh Mckenna. Ellie Thompson very kindly summarised her experience of the day. "A woodwind workshop might not be everyone's ideal way of spending a Sunday, but I think all the players who attended the NYO woodwind day on May 17th with Laura Jellicoe, flute tutor for the National Youth Orchestra and Hugh McKenna, oboist from the Halle orchestra, really enjoyed it; I know that I learnt many things which have helped me improve my flute playing since then." 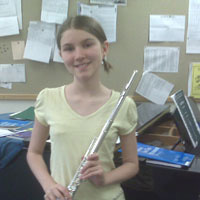 "Strangely, we started the day without using our instruments - Laura showed us the importance of breathing for woodwind players and we did some interesting exercises to help us with it. Next we took up our instruments and put our newfound breathing techniques into practise, before working on other areas such as tuning. After this we split into two groups for a master class session, the oboes and bassoons went with Hugh, and the flutes and clarinets stayed with Laura. Those of us who had brought some music to play were given some really helpful guidance with our pieces and it was a rare opportunity to listen to others in the different orchestras playing solo pieces." "After lunch, we all joined together again to play an orchestral piece, before finishing the day playing different ensemble pieces. This was one of my favourite parts of the day, because we got to play some challenging but fun music with people that we might not otherwise get the chance to play with. Overall it was a great day and I would like to thank Laura Jellicoe and Hugh McKenna for giving up their time to provide us with such a useful and enjoyable experience." "Being taught by Guy Johnston was an experience, which I feel privileged to have had. I feel that the cello section of the NYO will have greatly benefited from the input of such an esteemed player. Furthermore, the stylistic hints and tips that were on offer as well as the awe inspiring performances gave stimulation and desire to better ones own playing. I think I speak for the entire section when I say this. This was the first time the cellos have ever performed independently of the NYO orchestra. But, as a result of the overwhelming positive responses from the audience, and also the players, I am sure it would be an experience eagerly welcomed again. On behalf of the cellos of the NYO orchestra, I would like to thank both the organisers of this venture, and also the man himself, Guy Johnston. It truly was an experience not to have missed and one I hope shall be repeated in the future." On Sunday 29th April we gathered together at 11am (those of us who had remembered the time change!) 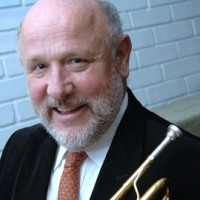 to welcome John Miller, head of brass at the Royal Northern College of Music in Manchester and former lead trumpeter in the Philharmonia Orchestra, who was going to instruct us in a Brass Master class. A very exclusive group of 8 players made the session even more individual and challenging as we lifted our instruments to play. However, as we began to tune up, John stopped us immediately and explained to us the importance of a proper warm up. 'You must warm up the instrument, your mouth, your entire body and your airways' which we then proceeded to do. It really focussed us. The morning consisted of a Master class of valuable and intriguing tips that proved useful for both the trumpets and the trombones. Both Dan Walton (trumpet) and Toby Martin (trombone) performed pieces that they had prepared in advance and it was a pleasure to see their skill. After a well-earned lunch break we began to play some pieces, including a brass octet by Gabrieli, which was great fun. At the end of the session, John had helped us all with our technique and for me it was a great chance to play with some of the experienced NYO players too. I for one certainly felt my game had been raised, just in a few hours. Thank you for a great day John. 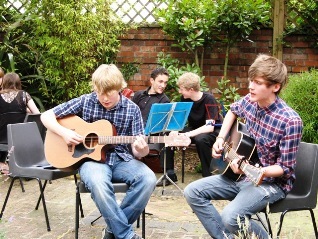 Straying away from the usual 'quartet gig' of weddings and receptions, 4 of our talented players joined together on October 3rd 2009 to perform in the Sandfield Centre as part of the Global Weekender music festival in Nottingham. Being the first act on for the evening was no mean feat, but Alana, Alex, Braimah and Sheku rose excellently to the occasion. Playing a mixture of classical and more modern pieces they brought a real contrast to the eclectic mix of music that was a feature of the festival. Well done to them all. Apparently, we are likely to be asked again next year, so watch this space for future dates.